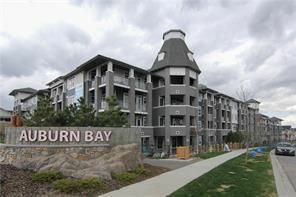 Practically BRAND NEW 1 BEDROOM + DEN SOUTH FACING condo, TWO TITLED UNDERGROUND PARKING! NINE YEAR BUILDER WARRANTY LEFT! Condo fee only $256 incl heat & water. CANOE complex by Avi Urban PRIVATE COVERED patio. BACKING onto COURTYARD. CLEAN & MODERN DESIGN featuring QUARTZ countertops, STAINLESS STEEL APPLIANCES & 9 FT CEILINGS. DEN can be used as dining room or office. Large Master w/walk-thru closet & cheater 4 pc bath. LARGE STORAGE/LAUNDRY room PLUS SEPARATE STORAGE LOCKER in Underground heated parking, Visitor parking, Elevators, PRIME LOCATION close to Deerfoot, South Campus Hospital (YMCA right inside hospital) schools, shopping, walk to Co-Op in mins! Walking distance to AUBURN BAY LAKEHOUSE COMMUNITY CENTRE; 43 acre lake, private park with skating rinks, spray park, beach volleyball & tennis court. 5 Min Drive to SETON where you'll find Superstore, Save On Foods, places to eat, Bank & so much more! DON'T MISS THIS RARE OPPORTUNITY - Yes TWO Parking Spots!